I first journeyed to the Isle of Palms, a South Carolina barrier island, to attend a Lowcountry Romance Writers (LRWA) beach retreat. For a number of years, the LRWA rented a beachfront house large enough to accommodate almost twenty where we balanced time between classes, eating, and lounging on the large porch or walking along the ocean’s edge. The location drew some excellent instructors, including Mary Alice Monroe, Bob Mayer, and Jennifer Cruise. It also attracted participants who could sign up for a “hermit week” of residence to concentrate on writing after the retreat. 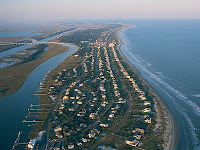 The Isle of Palms is in Charleston County, just minutes from downtown historic Charleston (across the Arthur Ravenel, Jr. bridge), and nestled between Mount Pleasant and Sullivan’s Island. If you want to take a virtual visit through fiction, try Mary Alice Monroe’s The Beach House or Dorothea Benton Frank’s Isle of Palms. 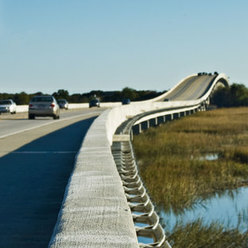 Access is by the Isle of Palms (IOP) connector, which passes over the vast expanse of the Intercoastal Waterway and a green salt marsh offering a calm, serene welcome--the feeling I imagine that visitors to Brigadoon must have encountered when they entered the surrounding clouds and heard the sweet voices singing. All cares and concerns remained on the mainland. 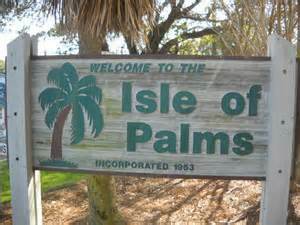 On the island, peace and relaxation awaited. Since that first trip, I’ve made a number of visits. Each time, I find the same sense of comfort and delight wash over me when that green salt marsh comes into view. I know the vacation has begun. At the end of the connector is a small town, with local government entities, like the town hall and fire station, and small businesses. Straight ahead and to the right is Ocean Boulevard, with hotels and restaurants on the beach side and public parking and a mall of small stores and eateries on the inland side. This is a place where you can come and stay in a variety of accommodations, or you can just make a day trip, park, cross the main thoroughfare, walk down the boardwalk, and stake out your place on the sand. 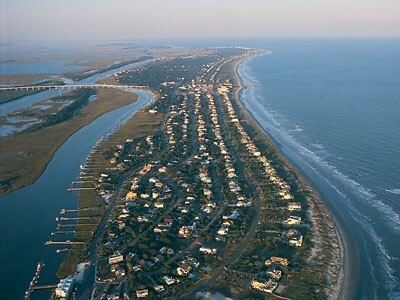 If your interest is history, the Isle of Palms has it. The original habitants were the Sewee tribe. The name “Sewee” means “Islander.” In the late 1600s, the tribe had a flourishing business trading deer skins for manufactured goods and beads with the colonists. When the Sewee learned they were receiving only five percent of what the buyers in England paid the colonists, they built a navy of canoes and sent their able bodied men and women with hides and possessions to trade directly with the English. Their canoes were no match for the high seas. The Sewee who survived the waves were captured by an English ship and sold into slavery. The children, elderly, and infirm left behind disappeared, probably from disease or warfare, by the 1700s. 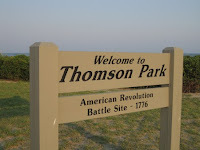 At Breech Inlet, Thomson Park, named for Colonel William “Danger” Thomson, commemorates the 1776 successful defense of Charles Town from the British army’s attack. 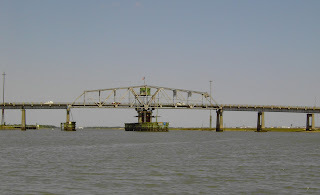 This also is the area where the H. L. Hunley submarine was launched during the Civil War. 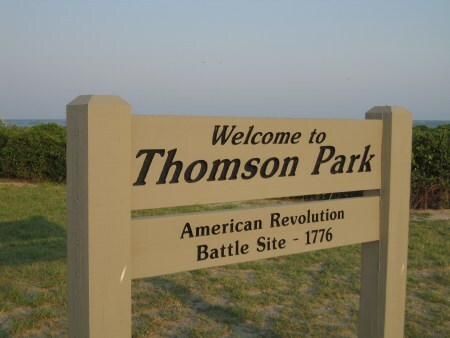 I had the opportunity to attend the ceremony dedicating Thomson Park. My friend Susan Craft, who writes historical novels, was among the exhibitors featured. The Park and Inlet area provides a lovely spot to enjoy the ocean. Often, you see people fishing or flying kites there. Seafood is fresh and plentiful. My favorite restaurant on the Isle is the Acme Lowcountry Kitchen. It offers local shrimp and fresh catch as well as pimento cheese grits and is frequented by residents, who will warn you to come early in tourist seasons. Nearby Sullivan’s Island has a number of restaurants, including Salt at Station 22, with a Culinary Institute of America trained chef who has developed strong ties with local farmers and fishermen to produce excellent lowcountry cuisine. Also, residents share their bounty with visitors. St. Mark’s Lutheran Church has offered lunch for summer visitors on the fourth Sunday of each month. When I’ve attended, there have always been fresh tomatoes and garden vegetables along with Southern hospitality. 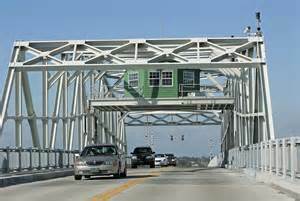 If you are headed back to Mount Pleasant from the Sullivan’s Island side, take the Ben Sawyer bridge, but be aware that you might find yourself waiting. 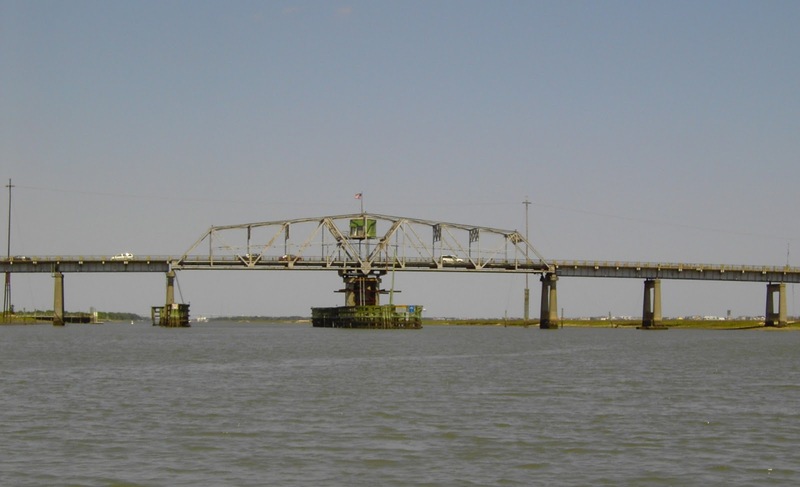 The Ben Sawyer is a swing bridge that opens to allow passage of ships. If you’re in line during an opening, get out and enjoy watching the slow water parade. Another reason that I’ve stayed on the Isle of Palms is its proximity to Mount Pleasant, where the Village Playhouse (now the Village Repertory Company at the Woolfe Street Playhouse) used to be located. Since that excellent theatre company has moved into a building on the edge of Charleston, the IOP is still a good place to stay and be close to both good productions as well as food and the ocean. 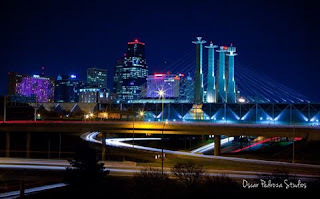 Mount Pleasant is a lovely town with plentiful shopping opportunities in its Towne Centre. I often find myself frequenting the large Barnes and Noble, which features books, audio, and a great coffee bar. 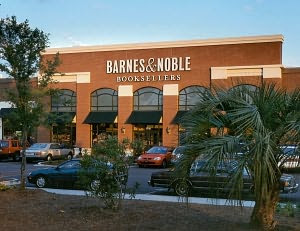 Barnes & Noble, Towne Centre, Mount Pleasant, S.C. Sorry, Sam. When being on the Isle of Palms is an option, I have to agree with E.B.--beach life is the best. Do you have a favorite beach and will you be there during the upcoming holiday? I'm late getting my post up today because I've been teaching at a writers' conference and came home at the end of it last night to go down sick with some nasty bug. So here is a talk I gave at the conference, edited for brevity. As a freelance writer and editor, among other things I do to make what is laughingly called a living, I screen manuscripts for several national book contests and review fellowship application packets for two artist residencies. One of the problems I encounter when reading slush pile or contest entries or fellowship application manuscripts is the writer who seems to come from nowhere and to exist in no particular space in the world. Unfortunately, I read a lot of manuscripts with good technique but no life, and with no roots, history, or culture to feed them, they’re not likely to ever develop any. These writers are trying to be universal, I suppose, but they haven’t learned the lesson that the specific and particular embody the universal and make it come to life. Everyone comes from somewhere. Perhaps from an urban slum, perhaps from a pristine upscale suburb, perhaps from an up-and-down series of foster homes, perhaps from great wealth or poverty or anything in between. Everyone comes from some place, some culture, some family. Somewhere where people talk and think a certain way and hold certain expectations. 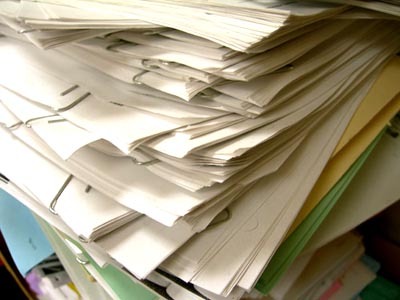 Too many otherwise good manuscripts, however, exist in limbo, in a cultural vacuum. I suspect, in part, this has become so prevalent because writers think their own backgrounds are not interesting or “exotic” enough. It seems to me that America has a paradoxical relationship with difference. We fear and hate the different, the Other, but we also exoticize it, investing it with greater interest and excitement than ourselves. These attitudes are actually two sides of the same coin since exoticizing the Other renders it even more foreign and Other and thus worthy of fear and hate. The result for writers, however, is that many writers feel their own backgrounds can never match the interest of the Other. One evening at a lively, crowded Latino Writers Collective event, a young woman was talking with two of us and the half-Iranian wife of another member. This young woman lamented that she had no culture to draw on for her creative work and wished she were Latino or Native American or Middle Eastern since that would give her cultural richness to write about. As I questioned her, however, I found that her father had come from Norway as a young child with his parents and her mother’s father emigrated as an adult from the Ukraine—two places rich with history, art, culture—but she knew nothing about them, had pretty much scorned them. I recommended she learn about where and what she came from instead of wishing she were someone else, someone “exotic.” These cultures and the upper Midwestern place in which she’d grown up were her donnée, her given. In a wonderful short story, Daniel Chacón has a Native American character and a Latino character—the only students of color in their MFA program—discuss their fellow students at a party: “They don’t even recognize what’s good about their own cultures, so how can they recognize it with anyone else’s?” one says to the other. Every writer has roots, the details of memory and obsession that make up their background and their finest, most charged material. I know a gifted poet who grew up in a trailer in a mining town in the Appalachians. Rachel has struggled to get an education, ending up with a Ph.D. from a highly regarded university. Always, she felt looked-down-upon because of her hillbilly background and accent. Instead of running from it as many have and trying to pretend to be from one of those upscale suburbs, when Rachel writes, she writes powerful poems from those very roots. And her poems are compelling in large part because of those roots. She writes about the prejudice she’s run into all her life, about the poverty and ignorance she left behind, but she writes also about the good in her culture, the richness and humor of the stories, about the art (mostly unrecognized as such by mainstream America), and about her family. Roots isn’t just a miniseries. Ancestral culture is something we all have, whether we know it or not. It’s a little easier for those of us who can’t escape it because of the faces, eyes, and hair in our mirrors or the names or accents that set us apart from the mainstream. For us, it becomes one of our obsessions because difference per se is an obsession with most Americans. And because, too often, difference equals less than to a number of Americans. This fact, underlined by radio and television daily, leaves us scribbling away to try and show that our people, our cultures, our languages are rich and beautiful and not less than anyone else’s. We all have our own specific roots, though, every one of us. And even if we’ve fought hard to escape from them, they leave a lasting impact on us, on the way we use language, and on our worldview. Witness F. Scott Fitzgerald who returned to the status of the once-poor outsider futilely trying to enter the ranks of wealthy society and win the rich girl of his dreams for his greatest work, The Great Gatsby. If Fitzgerald had tried instead to write from the viewpoint of someone born to that wealthy stratum of society, think what his novel would have lost. If we try to whitewash our roots out of existence so we’ll fit in better with the homogenized culture around us, we’ll inevitably shortchange our work. Increasingly in America, many of us are now what the Indigenous community (using imposed BIA terminology) call mixed-blood, what the Latino community (using imposed Spanish colonial terminology) call mestizo. We can pass as homogenized, middle-class, white/Anglo Americans (though many doing that are not really Anglo-Saxon, such as my friend of the Norwegian-Ukrainian background). It’s almost always easier that way—leave behind the non-Anglo-Saxon background, the poor or working-class background. Leave behind the chance of ethnic slur (there’s one for just about every non-British background). Leave behind the chance of socioeconomic slur (poor white trash, trailer trash, redneck, anyone?). But I believe the decision to leave our histories behind is a mistake. When we do this, we rob ourselves of riches we can use to make our writing come alive. Novelist Carolyn See and poet John Ciardi, along with many other writers giving good advice through the ages, have both said that a writer’s basic material lies in childhood and adolescence. You may write thrillers, but if you’re any good, you will turn to those first years of life and the relationships with family and the other people you grew up with for the emotional truth of your characters and the thematic obsessions of your books. To turn your back on your origins in order to pass as mainstream is to turn your back on the particular treasures that are your own. But what if that is your background—middle-to-upper class, white Anglo American? What if you did grow up in those pristine suburbs? Am I telling you that you have no culture or background? No future as a writer? Of course not. You simply need to make that background your own in writing about it by investing it with the life that comes from specific, telling detail and from obsession. Ann Sexton and Amy Clampitt did just that. So did John Updike and Robert Lowell. Yet could there be four more different writers? Their details and their obsessions were their very own, though they came from similar backgrounds, and these made their writing distinctive. Those are two of the most powerful aspects of writing that has a unique voice, writing that comes alive. Detail—the detail that only you would have noticed and invested with emotion—and obsession. The best writers write from their obsessions, and obsessions start in childhood and adolescence. They start back there in our family histories and the cultures in which we grew up. Dorothy Allison and Sharon Olds grew up in familial cultures of childhood sexual abuse. That’s one of the obsessions that fuel their work, but each one’s work is still very different from the other’s because they also grew up in different social cultures, Allison from a very poor rural Southern background, Olds from a working-class urban Californian background. We all come from several different cultures at the same time—familial, social, educational—and these may change as we grow and age. A friend of mine was born in Colombia and came to this country as a young boy. When Joe arrived in this country, he and his brother knew no English, so his mother, who had immigrated several years ahead of her children, refused to speak Spanish with them, insisting they speak only English. Though Joe has never lost his slight Spanish accent, he had to work hard as an adult to regain his fluency in Spanish. His education was all in American schools and universities, so, often, the topics of his poems and stories may not seem outwardly Latino. He will write about classical Greek myths and classical American myths, such as Hollywood stars, because these were part of the culture in which he was educated and grew up. Still, Joe’s stories are also rooted in the experience of that young boy whose mother left him with relatives for years and would only speak a language he didn’t understand when they were finally reunited in a strange, new country. Joe’s stories and poems are always rooted in the experience of being an outsider, even in his own home. I know. I know. It sounds like the old “write what you know” stuff, doesn’t it? I don’t mean to set limits, however. If you find yourself obsessed with some other culture in which you didn’t grow up—the way John Steinbeck did with the Okies of the Dust Bowl—throw yourself into that culture. Live with it and learn it. Steinbeck “imbedded” himself with the Okies as they trekked from Oklahoma to California and as they tried to live in California. That’s the way he was able to write The Grapes of Wrath with such powerful authenticity. My advice is to root yourself as a writer. Go back to your own origins. Mine your memories, seeking those emotion-freighted, telling details and your own obsessions. Learn about your own history and culture—all of it if you’re a mix of more than one, as most of us are. Remember the language and idiom of your earliest family. And if you want to write about cultures and people foreign to your experience, root yourselves just as deeply in those also. Find your roots as a writer, and I believe you will find your voice. Isn’t that what we all look for when we read—a unique and distinctive voice that allows us to see the world in a way that’s slightly different from the way anyone else does? What’s the old adage about giving your children roots and wings? Well, give your writing roots, and you’ll give it a chance to take flight.